THE HEALTH and Safety Executive (HSE) report has found that the printers can create harmful emissions, potentially endangering users. The use of Fused Filament Fabrication (FFF) and Fused Deposition Modelling (FDM) 3D printers has grown rapidly in recent years, however concerns have consistently been raised over the safe use of the products and their impact on surrounding air quality. Concerned about the unregulated nature of 3D printer use, in 2015 the HSE formed a working group including HSE scientific and regulatory staff, Kora 3D and the British Standards Institute to identify the risks and to develop a series of good practice guides for the safe use of FFF/FDM style desktop 3D printers. Kora 3D committed to working with the HSE to investigate the risks, making the commitment to suspend sales of its own FFF/FDM style 3D printers until the research was complete. Worryingly, the HSE’s research also found that some of the plastic filament materials used in the 3D printers were found to release vapours known to be hazardous to health when heated. During testing, the HSE found that placing the desktop 3D printer inside an enclosing hood with filtered ventilation reduced particle emission rates by 97 per cent. 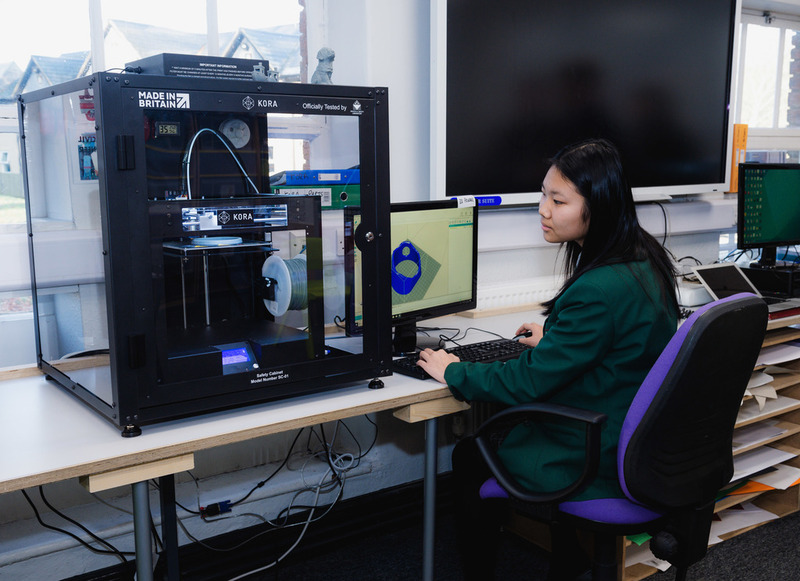 As a result, CLEAPSS (the Consortium of Local Education Authorities for the Provision of Science Services) CLEAPSS 3D Printer report, an advisory service supporting science and technology in schools, has already issued its own urgent guidelines to try to protect staff and pupils using desktop 3D printers in schools, and it’s anticipated other sectors will follow suit. Businesses using 3D printers without adhering to new guidance could find themselves in contravention of Provision and Use of Work Equipment Regulations 1998 (PUWER), Control of Substances Hazardous to Health (COSHH) guidelines and the HSE’s ‘Management of Health and Safety at Work’ code of practice. In line with the recommendations from the HSE, Kora 3D’s talented team of engineers have developed the universal and economical Kora SC-01 Safety Cabinet, designed to fit most standard sized FFF/FDM style desktop 3D printers. It uses a specialist filter cartridge at the top of the cabinet to draw clean air from the area in which it is situated and to remove potentially harmful emissions. The SC-01 is, to date, the only FFF/FDM style 3D printer safety cabinet to have been officially tested by the HSE’s specialist Health and Safety Laboratory (HSL). Managing director of Kora 3D Steve Burrows said, “It’s clear that FFF/FDM style 3D printing is a growing sector and one which offers fantastic benefits to business. However, our four-year study alongside the HSE has confirmed the importance of having a greater understanding of the equipment and the need to pay more attention to safety management. It was a huge commitment and a risky commercial decision to cease sales of our FFF/FDM style 3D printers. However, we strongly believed that although FFF/FDM style 3D printing delivers huge benefits, not enough had been done until now to investigate the potential risk to users and bystanders.